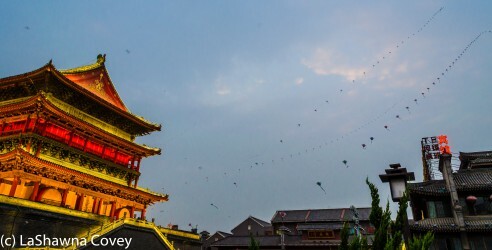 As I’ve mentioned in previous blog posts, Xi’An wasn’t EXACTLY what I expected. Part of me envisioned a Chinese version of Bruges, Belgium, but that is definitely not the case. 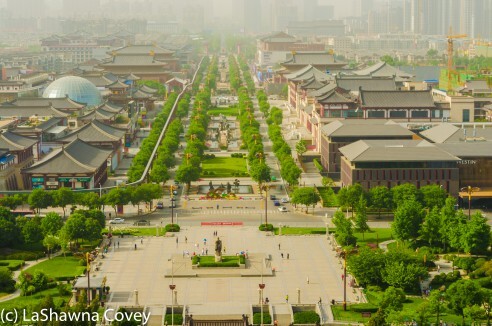 Xi’An is very much a modern Chinese city these days. 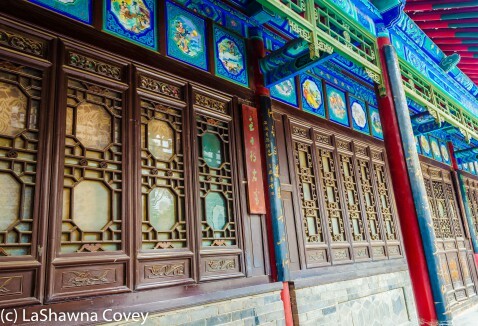 However that doesn’t mean that Xi’An doesn’t have its pleasures ready to be explored. It has all sorts of temples, towers, pagodas, restaurants. It’s just that they are spread out around the city and sometimes found outside the city walls. 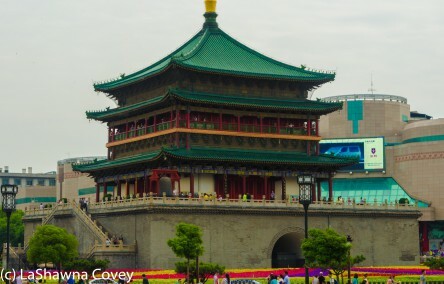 Bell Tower, pictured above, is located in the center of Xi’An within the city walls. It’s sort of the focal point of all the roads, particularly the roads leading to and from the main gates exiting the city, and a good chunk of the vehicle traffic goes around the large roundabout. Even though it was a completely different setting, I kept thinking of the scene in “National Lampoon’s European Vacation” where the Griswolds were stuck in a roundabout all day. A few hundred meters northwest of Bell Tower is Drum Tower. It’s pretty much the same setup as Bell Tower. In both cases, you can pay to ascend the tower and get a view of the city outside. Neither tower is really of any historical value; they’re just attractive viewpoints. 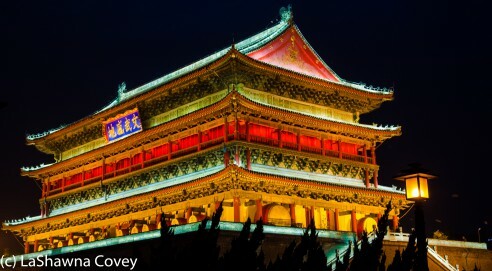 Both towers are beautifully lit up at night and are some of the most attractive sites at night. Both towers are open from early morning to around 2130 at night for a visit. At night, the kites came out in force and swayed beautifully in the wind and the setting sun. 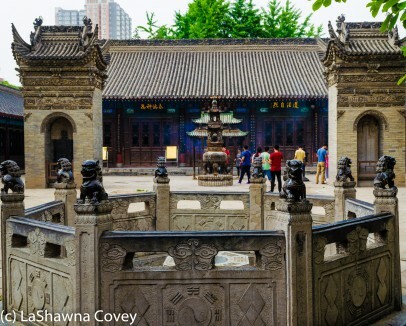 Located a reasonable walking distance from the East Gate is a small, peaceful, interesting Daoist temple called Ba Xian An, or Temple of the Eight Immortals. 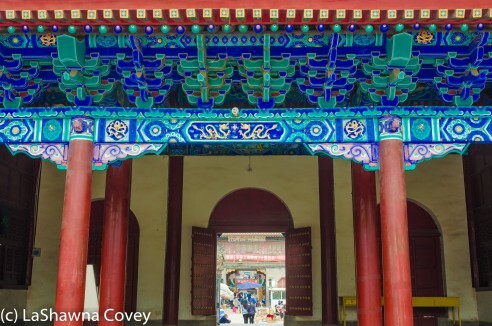 The temple is located between narrow alleyways, and is across the street from one of the antique market streets. 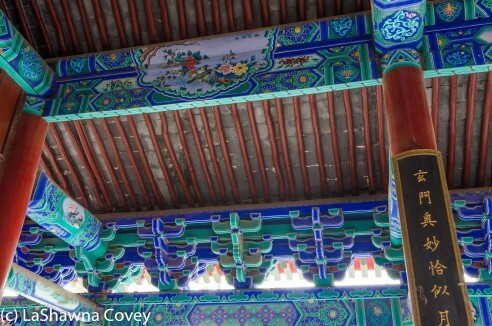 The colorful walls and decorations are very different than the other temples in town and the courtyard decorations are also really well done. However I wanted to walk to the temple, because I wanted the exercise. I was staying at a hostel near the South Gate and tried to fit in an early morning visit to the temple before a day tour. It was about a 30 minute walk from the South Gate to the East Gate. It was all going well, until I tried to tailor my guidebook directions for a walk and it just wasn’t happening, particularly since the maps I had were a bit generic, and there were no signs pointing the way. On my second try, I decided to take a taxi just so I could be sure to find it. I discovered that I had nearly found it on my first trip. I just hadn’t walked far enough down the road and turned back in frustration. So knowing this, walking to the temple is very easy. Walk outside of the big East Gate and cross the divided street and keep walking straight down the main road. The road will curve a few times, but keep walking, and soon enough you will arrive at the temple complex on your left. You can’t miss it. 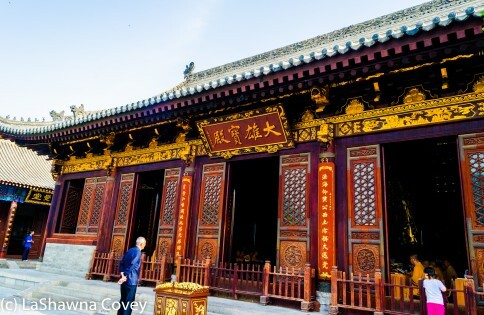 The temple is open from 0830-1800, and with the low price of admission of 3 yuan, it is one of the cheapest visits in town. On my final morning in Xi’An (I had a noon flight back to Korea), I visited the Da Yan Ta, also known as the Great Goose Pagoda. The construction of this temple started in C.E. 652, and the style is similar to some temples in India. 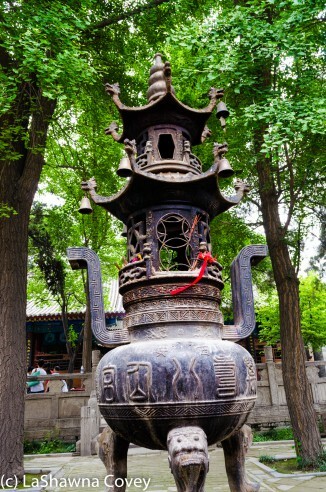 Also on site, very near the base of the pagoda is a the Da Ci’en Si or Temple of Great Goodwill. 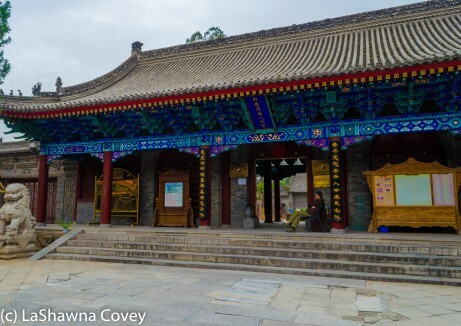 The temple is Buddhist, and is very elaborately and colorful decorations, like most Buddhist temples I’ve visited. 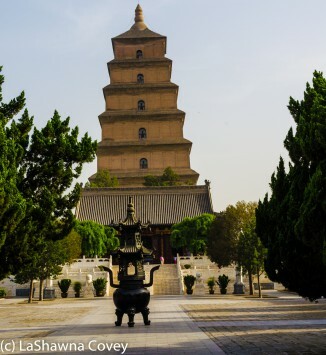 The Great Goose Pagoda is about seven stories tall, and you can climb the pagoda for a panoramic view of Xi’An. 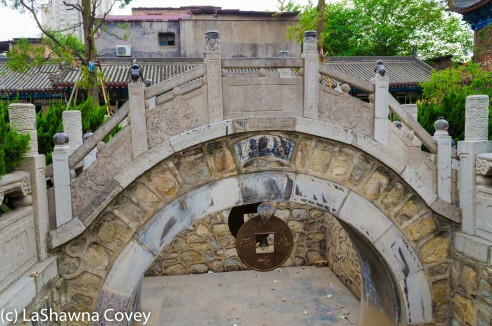 It costs 50 yuan to enter the temple complex, with an additional fee of 20 yuan to climb the tower. I arrived at the pagoda shortly after it opened, so there was no crowd and it was easy (though temporarily strenuous) to climb the stairs to the top. 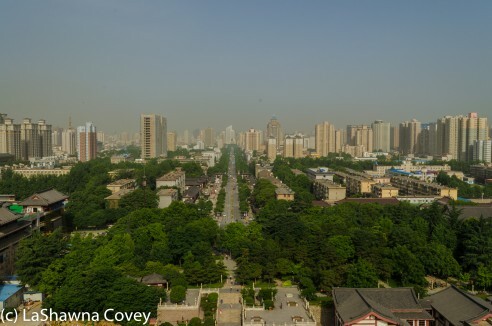 However, the view from the top of the pagoda, while nice, is probably not worth 20 yuan in my opinion. 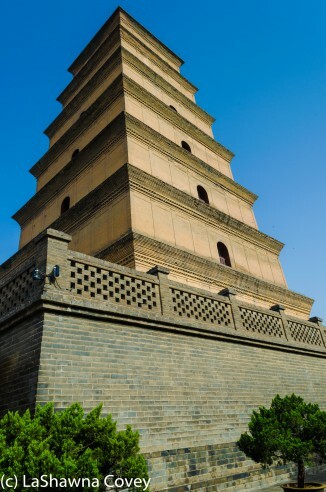 The pagoda is located south of the city walls, and the walls aren’t visible from the tower. While attractive, the view is nothing special or particularly breath taking. 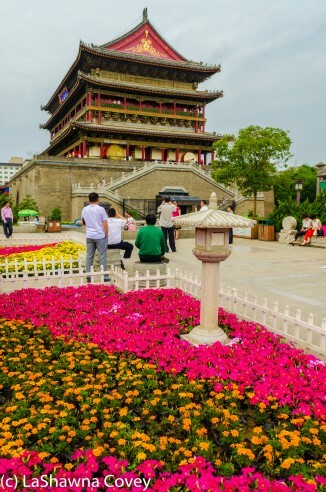 The pagoda itself is located in a central part of an urban planned shopping complex and park. It is very attractively located, though decidedly modern with no real traces of antiquity left. 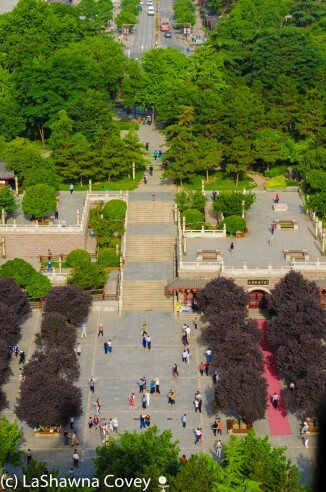 There is a nice park immediately below the pagoda and I could watch couple ballroom dancing in the park (something rather common across China). Getting to the pagoda complex is easy, particularly if you don’t mind some walking. Since the pagoda is located a few kilometers south of the South Gate, and since I was short on time on my last morning, I decided to take the subway. The subway is very new and opened within the last couple years. It is very clean, modern, and easy to use. I was afraid the subway would only have Chinese signs, but it is very well marked in English. The nearest subway stop for me was several hundred meters south of South Gate, and it was only a few stops. The nearest subway stop is off Line 2, Xiaozhai. Take exit C and walk eastward for about 10 minutes. You can also take a wide variety of busses or a taxi as well to the complex. Tickets will vary by length of trip, and there are self service ticket machines that are easy to use. However, one key point, is that the ticket machines don’t take 1 yuan bills (it does take 5 yuan bills), but does take 1 yuan coins. 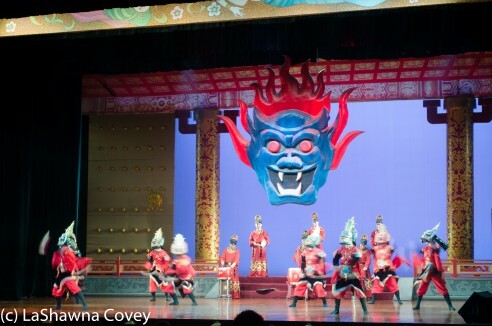 While there are a variety of bars in Xi’An, one of the biggest offerings for tourists is a night dinner and show. Pretty much all hotels will offer up a tour to a dumpling banquet/show. 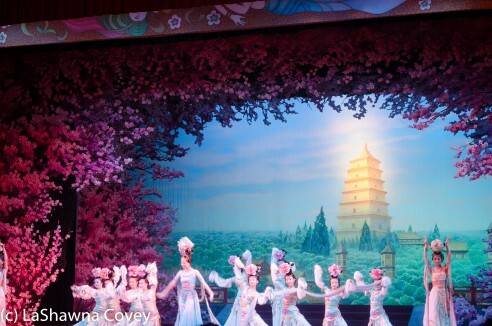 There are a couple different possibilities, but the best one, or at least the closest to authentic, is Shanxi Grand Opera House (Shanxi Gewu Da Xiyuan). 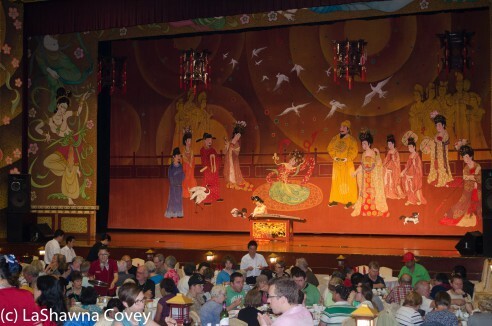 The typical night out is a massive dumpling buffet and a show. 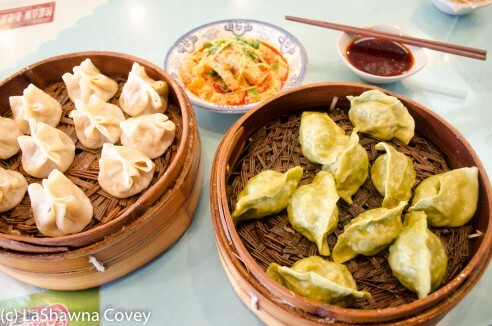 So many different dumplings are offered for guests to feast on. They were so delicious and JUST on the side of too much, but I didn’t want to stop eating them. 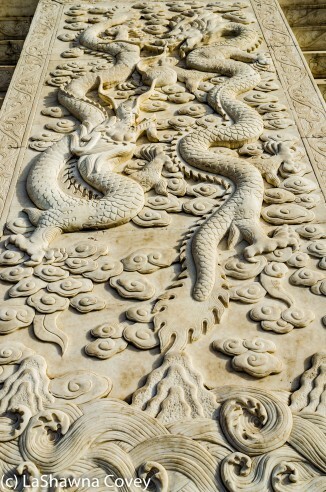 The site is a large, beautifully decorated banquet hall. 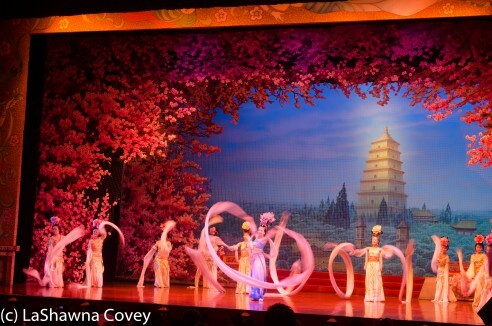 After dinner, the show lasts about an hour and shows examples of more traditional Chinese entertainment for the region. 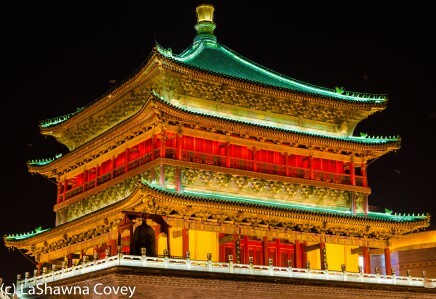 While Xi’An isn’t a sleepy, traditional hamlet, there are still plenty of interesting, beautiful and historical sites to be seen and experienced in town that can enhance any visit.